Talk to any serious bodybuilder and you will hear about creatine and its incredible benefits. If you are looking for a pure creatine monohydrate supplement Firm Foods Creatine is the right choice. Firm Foods Creatine was created for serious athletes like you who accept nothing but the best nutritional support available. Each serving is power-packed with 5000mg of pure micronized creatine monohydrate, which is easily absorbed and digested by the body. Countless studies have proven the amazing benefits of creatine for sportspeople. First off, it boosts your body's production of ATP (Adenosine Triphosphate). With higher levels of ATP, you are able workout at higher intensities and for longer time periods. Since creatine gets stored inside your muscles, it leads to muscle expansion and increased muscle volume. Creatine also buffers the buildup of lactic acid, which means that you can lift weights longer without dealing with that burning sensation in your muscles. Creatine is a well-researched ingredient that is used by millions of bodybuilders worldwide. If you feel your progress could improve, move to the next level with Firm Foods Creatine! 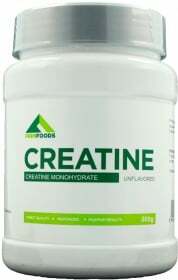 “Creatine 500g Buy 2, Get 3” is currently out of stock. Enter your details below and we will let you know when it's back in stock. Mix 1 serving (5g) in 400ml of water or your beverage of choice. Consume once daily, preferably post-workout. WARNINGS Creatine : Do not exceed recommended dosage. Keep out of reach of children. The product should not be used in case of hypersensitivity or allergy to any of the ingredients of the formulation. Food supplements should not be used as a substitute for a varied and balanced diet and healthy lifestyle. Store in a cool, dry place. Please Recycle. BEST BEFORE: Please see lot number and expiration date stamped on the packaging.